I headed to my trails and found a bike parked there. This doesn’t happen very often. Most of the bikes that come to my trails go on my trails. But this bike is different – in more ways than one. I see lots of people put stickers on their cars, but I don’t usually see them on bikes. 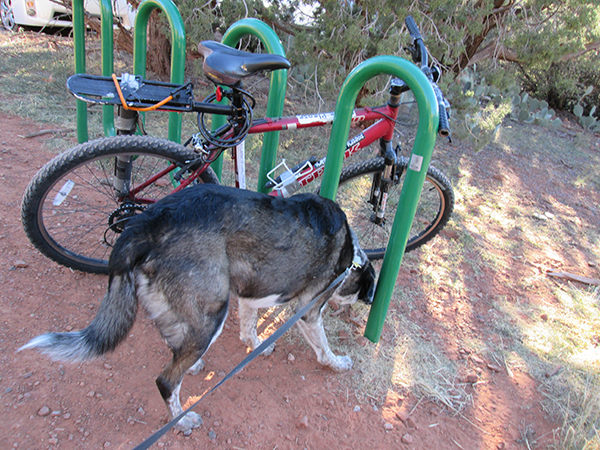 Actually, I don’t think I’ve ever seen one on a bike on my trails before. But this bike must be special. 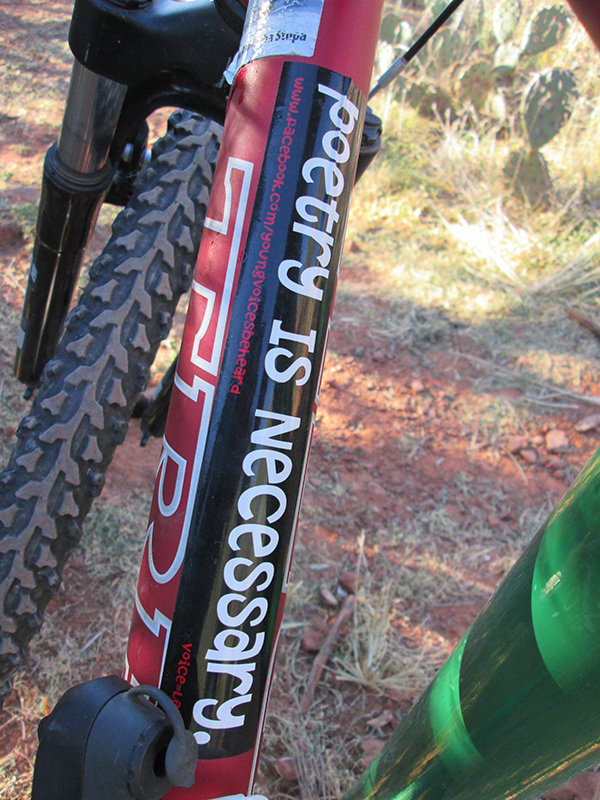 This bike says poetry is necessary. Does that mean I have to write poetry? Is it as necessary as eating, or sleeping, or going on walks on my trails? Okay, I guess I’ll write a poem. Wait a minute! What happened there? Those words just came out. They’re not what I wanted to say. That poetry writing took right over and started writing its own words. Maybe I shouldn’t be writing poetry. But I can’t stop yet. I’ve got to get that bear first. Take that you mean old bear. And don’t come back either. Wooohooo to my fellow poetic pup! Ku, I was hoping you’d stop by today. I thought of you when I was writing these poems. Oh Bongodog, you are a scream! They will never let you go!!! lots of hugs and kisses too. Patrecia, that’s a great poem. I’m glad I inspired you to be poetic today. Thanks Marina. Maybe next time I’ll find a sticker that says to eat fish. Lola, you’re as good a poet as I am. Thanks for sharing. That poetry bike really inspired you, B. That poetry flowed right out! I hope there’s not really a bear! Cupcake, there’s no bear. I chased him away. Actually, I’ve never seen a bear on my trails. There are some in the area but people and dogs don’t see them very often. Thanks Kevin. I do my best. Rumpy, we’re two of a kind when it comes to poetry. OMG, Bongo, suppression is not healthy! Don’t repress the Poet Laureate in yourself! Kolytyi, I guess I just have to learn how to control that Poet Laureate so I only say good things about myself. Thanks Little Binky. I do my best. Ginger, that’s an awesome poem. 3, 5, 7, 9, Ginger’s and Bongo’s poems are fine!